Felix Antoine Blume, better known by his stage name Kollegah, is a German rapper of Canadian descent born on August 3rd, 1984. He is widely credited to have established multisyllabic rhyming and doubletime rapping in German hip hop. In the 2000s, Kollegah released a number of albums and mixtapes, all of which were immediately praised by critics and hip hop fans alike. Even though most of these albums are considered modern day classics retrospectively, they weren’t commercially successful. In the 2010s, Kollegah’s music caught mainstream attention, partly due to continuous praise by the popular German YouTuber JuliensBlog. Since then, each of his albums managed to be hugely successful, resulting in Kollegah earning several gold and platinum certificates, and many of his music videos reached tens of millions of views on YouTube. Kollegah’s overnight success had huge impact on the German rap scene, and his rhyming scheme, image, flow and wordplay have since been much copied in the entire genre. Most of Kollegah’s albums continued to be critically and publically acclaimed. 2009’s “Zuhältertape, Vol. 3” is widely regarded as his best album by fans and critics alike, while 2014’s “King” is his commercially most successful. Kollegah is widely considered one of the greatest and most important German rappers of all time, and there is a debate whether he or Kool Savas earns the honorific title “King of Rap”. Among his trademarks are continuous multisyllabic rhyming schemes, inventive uses of homophones and double entendres, a very advanced vocabulary, and a fast doubletime flow. In most of his songs, Kollegah portrays the stage persona of a pimp, and refers to himself as a “Zuhälterrapper” (“pimp rapper”) or as “Der Boss”. He also raps about other criminal activity such as drug trafficking or murder, mostly in a cinematic, Hollywood-like fashion. Earlier in his career, several of his songs were over-the-top and tongue-in-cheek, but as his popularity increased, the overall tone became darker and more menacing. Despite his fictionalized image, he occasionally also interpolates personal experiences and feelings, and has some conscious hip hop songs as well. Kollegah is furthermore known for his feuds with other famous rappers, such as Fler or SpongeBozz, as well as for his friendship and frequent collaborations with popular rapper Farid Bang. Kollegah is the head of hip hop label Alpha Music Empire, which he founded in 2016. 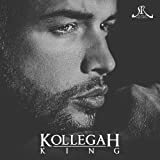 Top Ten Songs from Kollegah's & Farid Bang's "Jung Brutal Gutaussehend 2" Top Ten Songs from Kollegah's "Alphagene"
Best Songs from Kollegah's Self Titled Album Top Ten Songs from Kollegah's & Farid Bang's "Jung Brutal Gutaussehend"
Top Ten Songs by Kollegah or SpongeBozz that Last 6 Minutes or Longer Top Ten Best Songs from Kollegah's "Alphagene", "Kollegah" or "Bossaura"